Hello again! We are hopping with the Color Fusers today. Join us the first Monday of each month as we create using the same color palate. This month feels like spring! I thought these colors would work great to create an ombre background, so I am sharing a fun technique using Embossing Paste. It's so easy to use, and can add huge wow factor! Cut a piece of Melon Mambo cardstock 4 1/4" x 11" and score at 5 1/2"
Cut a piece of Mango Melody cardstock 3 5/8" x 4 7/8"
Cut a piece of Very Vanilla cardstock 3 1/2" x 4 3/4"
First, I created the ombre background on Very Vanilla cardstock. While it dried, I stamped the sentiment, which is from the Waterfront stamp set, in Melon Mambo ink on a 2" vanilla circle and added some layers for interest. A little gold thread (-LOVE- this stuff) and Pineapple Punch ribbon behind it worked perfectly to help it all pop. I added a Mango Melody layer behind the ombre background before adhering it to the card base, than attached the sentiment with some dimensionals. Finally, I finished it off with a few gold sequins. Have you worked with it before? It is such a fun product and really is easy to use! It comes in plain White, Shimmery White, and gorgeous Silver. I used Shimmery White for this project. It is beautiful! For the embossing paste design, I used a stencil. The Pattern Party Decorative Masks set contains 4 cool stencil patterns. Here are some of the other designs I created at the same time. I will save these to make more cards. And here is how I created the ombre background. See how easy? Why don't you try it! All the supplies can be purchased in my online store, head on over and grab them now! Click on any of the products below to take you there. And while you are there, check out the new Storage by Stampin' Up! products which are launching today! Use the host code below when placing your order, and receive a gift from me! Thanks for stopping by! The next stop is Bonnie O'Neill, and she is sure to have something you want to see! Or head back to Paola Phillips. And in case you get lost along the way, here are all the stops on the hop. Photorealistic designer series paper is not always my thing. I just have not figured out how to use it well. However, the Petal Promenade designer series paper from the Annual catalog is gorgeous! I have used it a lot. The colors work well together, and it carries a card so well. On this project, I have chosen to pair it with the Enjoy Life stamp set, also from the Annual catalog. It has some really great sentiments. I especially like this one. Since Sale-A-Bration is almost over -- GASP!! -- I wanted to get a little more use out of the extras that have been added as FREE gifts with purchase. Did you know you can get this gorgeous paper FREE? A whole pack of it! 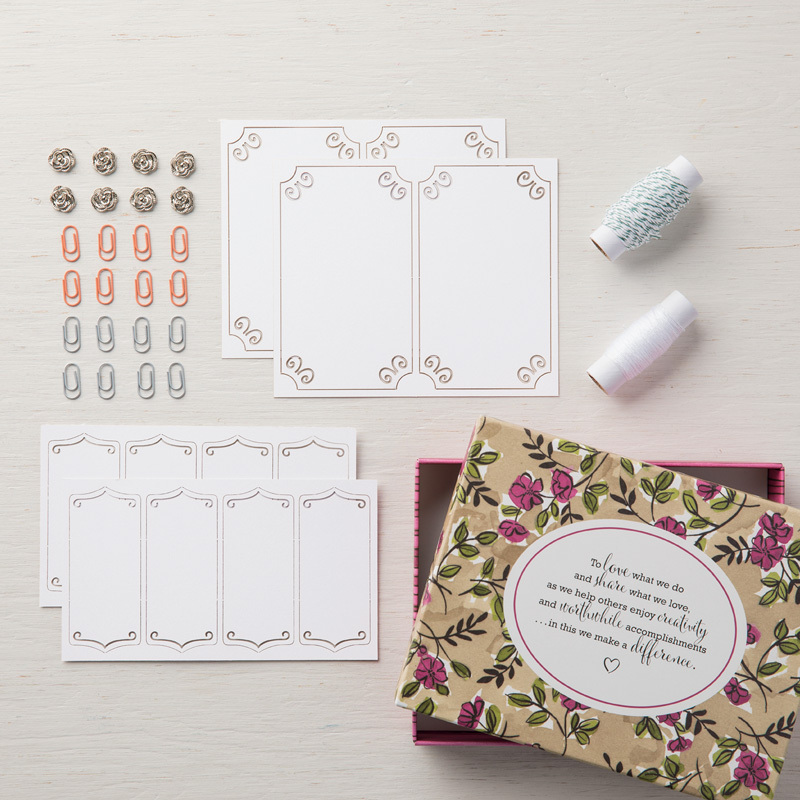 In addition, you can get the Share What You Love embellishment kit FREE as well. This little box is packed full of hidden gems, including this beautiful laser cut tag, which I used for the sentiment, and the adorable mini paper clip used as an accent. cut a 4 1/4" x 11" piece of Mossy Meadow cardstock and score at 5 1/2"
Using the large scallop die from the Seasonal Layers thinlits, die cut a long scalloped edge on the designer series paper and glimmer paper before layering on your card. Tie a piece of gold sequin ribbon around a mini paper clip, than tie it to the tag with a piece of Calypso Coral ombre ribbon. Add some gold sequins for a finishing touch. This card is quite simple to make and comes together quickly. What do you think? Try making a card with photorealistic paper and share it with me. I would love to see it! 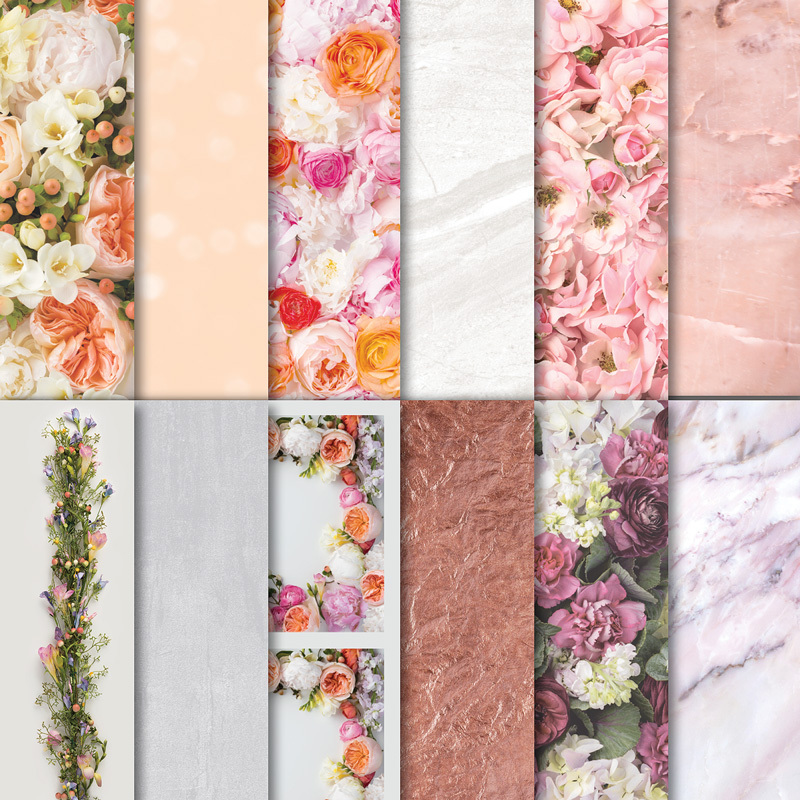 Would you like to get a pack of the Petal Promenade designer series paper FREE? Place an order of $50 or more in my online store by March 31st, and choose it as your FREE sale-a-bration gift! I am happy to be hopping with the Color Fusers this month! Join us the first Monday of each month as we create using the same color palate. This month includes one of my favorites, Gorgeous Grape! I love the teapot in the Tea Together stamp set from the 2019 Occasions catalog. And as part of the Stampin' Up! Sale-A-Bration promotion, the coordinating Tea Time Framelit dies are FREE with a qualifying purchase! This month, I choose to create an elegant card using shimmery white cardstock, and used the Smoky Slate for depth, allowing the Highland Heather and Gorgeous Grape to add the perfect pop of color. Cut a Shimmery White card base 4 1/4" x 11" and score at 5 1/2"
The ink wash gives the teapot a subtle bit of color. I added more ink to the wash for the flowers. To create depth, layer several Smoky Slate teapots behind the white tea pot. Little die cut scraps from the Delicate Lace edgelit die work perfectly to add detail to the teapot. A strip of Smoky Slate cardstock grounds the teapot and adds a great base for the Gorgeous Grape striped ribbon. For the finishing touch, I added some Glitter Enamel Dots to the centers of the flowers. I hope you like it! Thanks for hopping along today. Next up is Bonnie O'Neill at Bonnie Stamps. She always has a great project to share, check it out! Or go back to the previous stop, Nicolle Belesimo. Melanie Hockin ◄ You are here! Sale-A-Bration is ending soon! Head over to my store and gather your supplies to make a Tea Time card while you can still get your dies and embossing folder FREE with a qualifying purchase! Here are the products I used. Use the current host code to receive a thank you gift from me with your order!